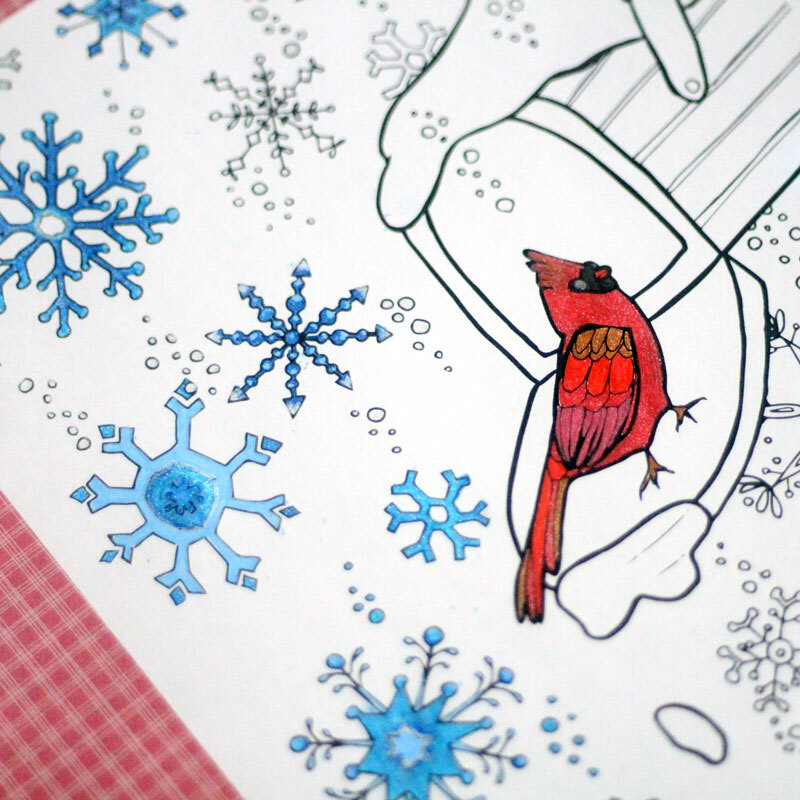 I hope you LOVE this winter snowflake coloring page for grown-ups, a fun and slightly different free printable colouring page! 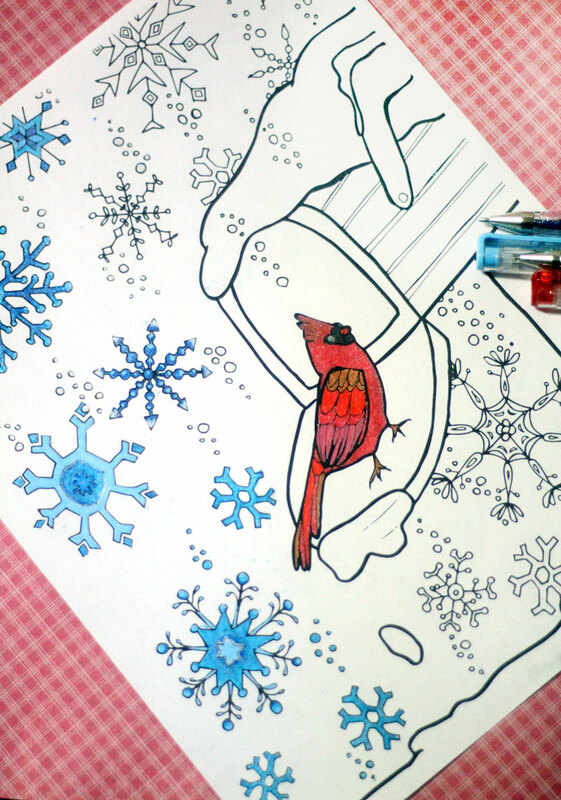 Check out the complete list of free printable winter coloring pages for adults and then stop back in for this one. It all started with a mailbox. Then it snowed. The bird came and perched on top. 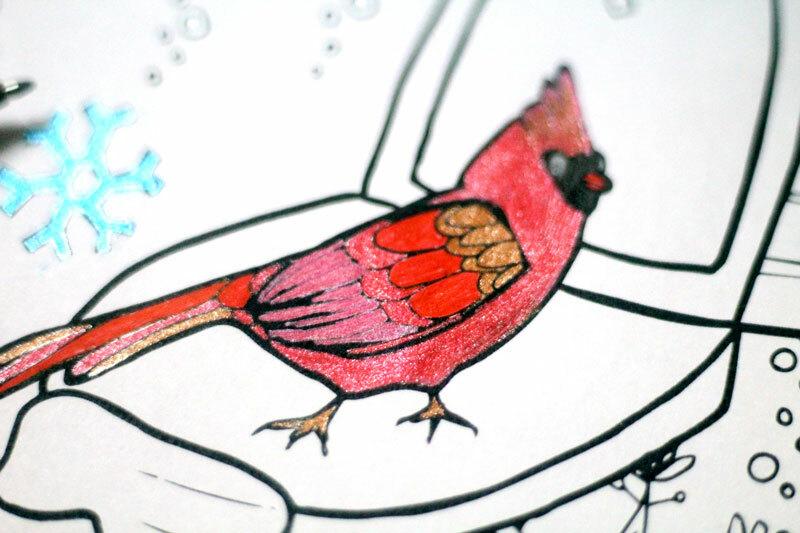 I realized it needs to be a winter bird, so it turned into a cardinal. 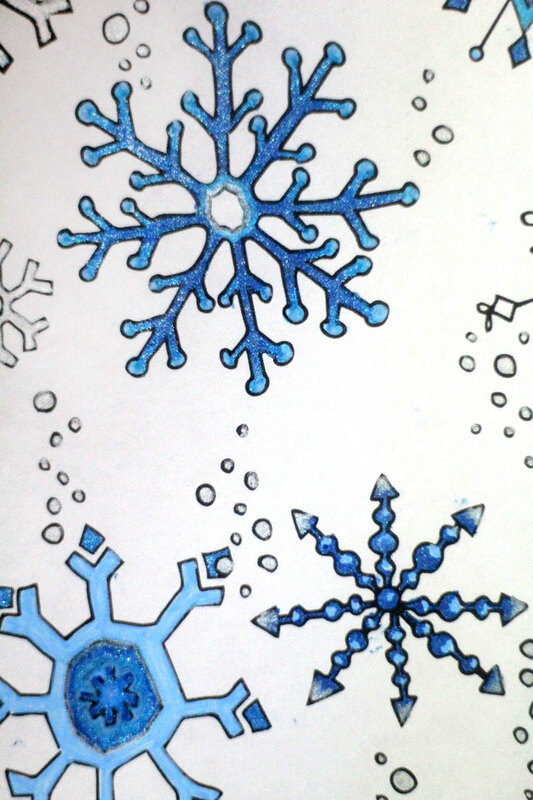 Finally, some pretty snowflakes appeared all over. And the coloring page was complete. But my favorite part is the way the snowflakes sparkle. Only some of the gel pens I used were metallic/glittery, but even the ones whose only purpose was to add a little brightness and shading contributed to the vivid effect. 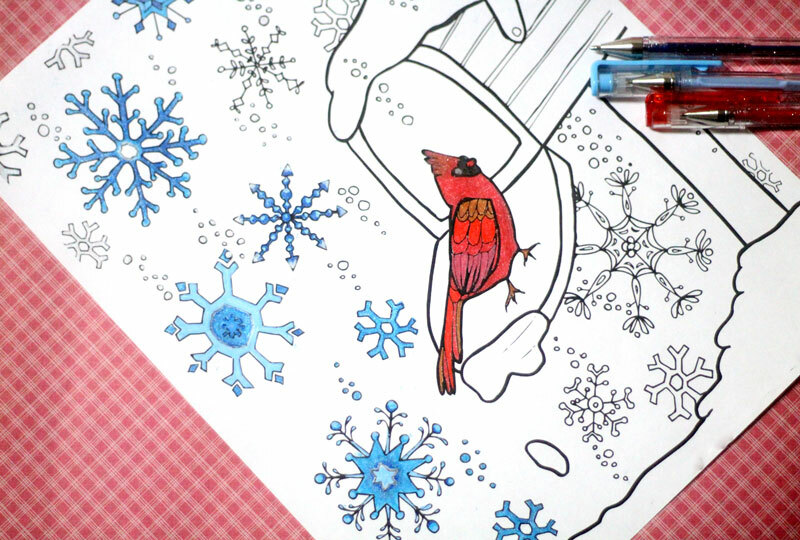 In general, I love how the colored snowflakes came out. 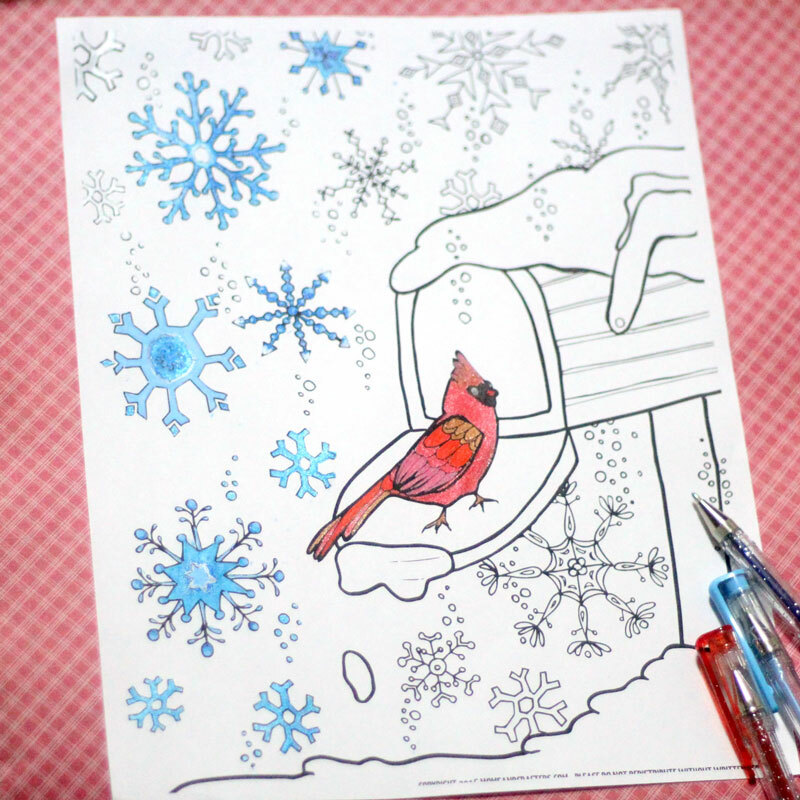 Gel pens are surprisingly easy to shade with (although I think I might use colored pencils for the mailbox, as that’s better for adding texture). They stay wet for a bit so you need to watch out for smudging, but that also allows you to layer/mix and to blend it a bit with your finger. My oldest memories of snow seem to surround the mailbox. 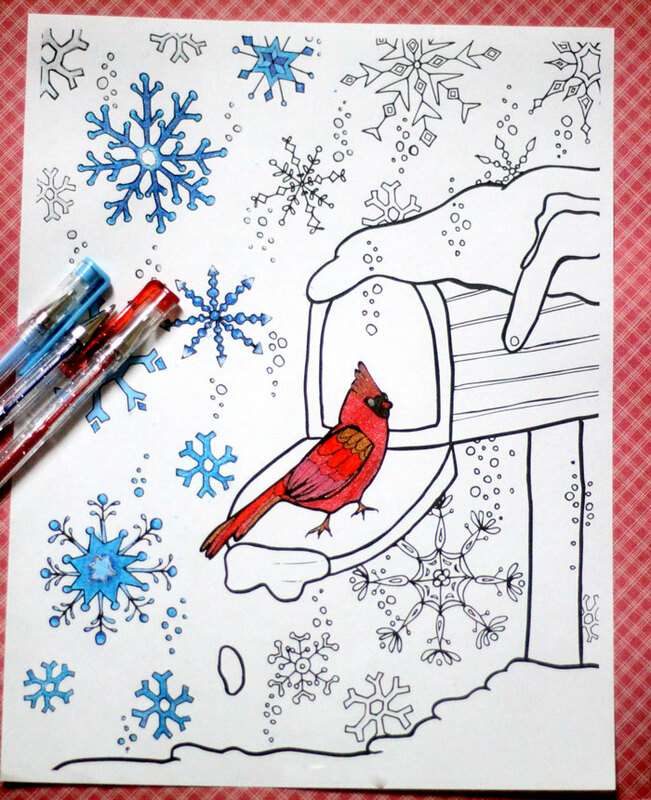 I really have no idea why, but I think that’s what caused me to start off this winter coloring page for adults with a mailbox and to build around that. 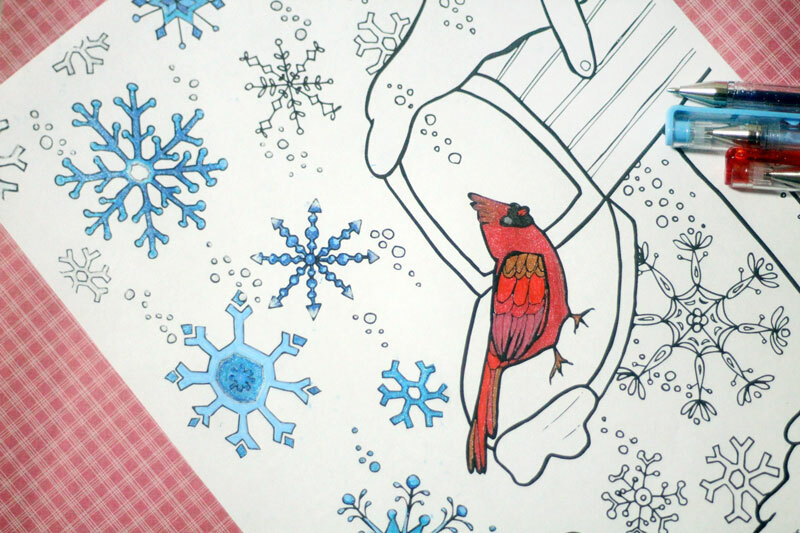 I do like the mix of broader area that presents a blending challenge, and the finer detail of the snowflakes. For the snow, I’d recommend working with soft blues and building up shadow and highlight areas. You can do this with colored pencils , or try doing it with the light blue gel pen, building more of a sharp shadow area rather than blending. I do plan to color the background black but I’m afraid that might ruin it, so I made sure to photograph it to share with you before I attempted that! 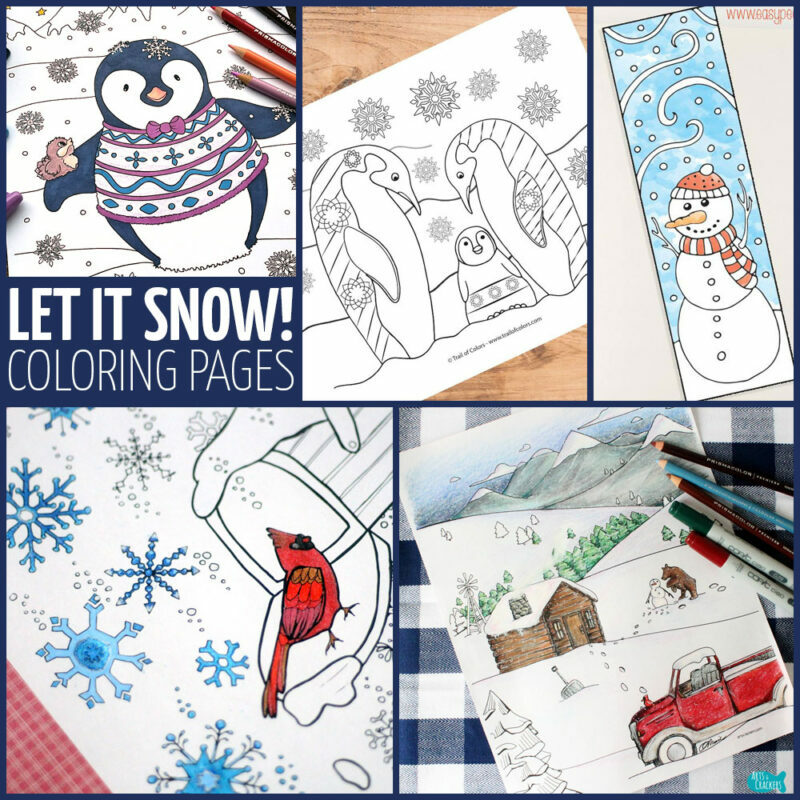 This page is simply waiting for you to add your color and personality to it! 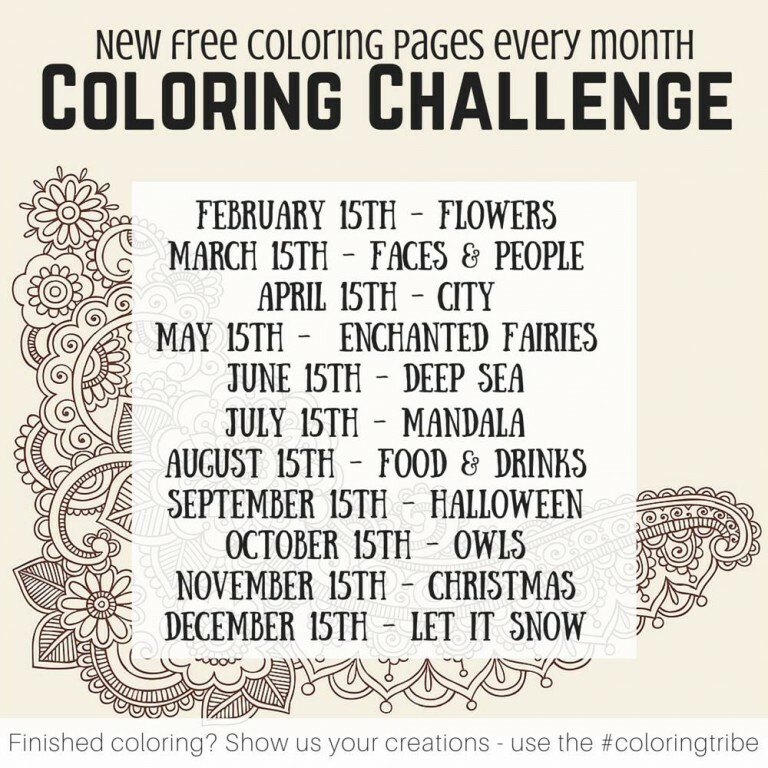 I’d love it if you shared with me your coloring, by posting to the Coloring Tribe group, to my Facebook page or by emailing it to me. Credit will always be given to you if I share it! What is your favorite early memory of winter? Comment below! 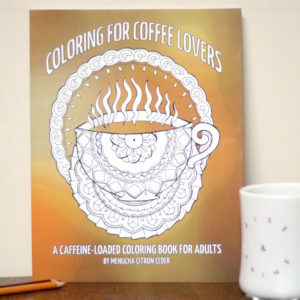 Adult Coloring, Adult coloring pages, Crafts for Adults, Crafts for moms, Crafts for Teens, Free Printables, Grown-ups, Holiday and Seasonal crafts, Tweens/Teens, Winter crafts. Bookmark. 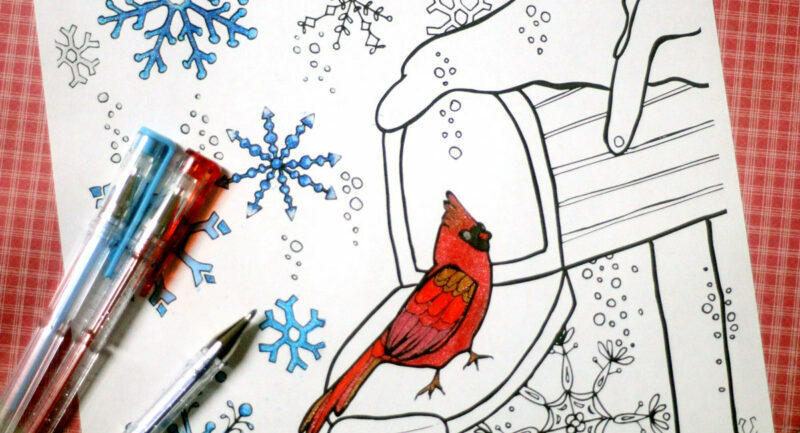 Pingback: 10 Free Winter Coloring Pages for Adults - Print and Color Today!